As a former high school chemistry and physics teacher, I am pleasantly surprised by the focus on education linked to research in space. For example, I was just at the American Society for Gravitational and Space Biology (ASGSB) annual meeting in Washington, D.C. This gathering included a hands-on workshop and panel geared towards education and I was inspired by the positive, exciting, next-generation focus of this group of professionals. The ASGSB meeting is the first conference I have been to in a long time where they planned to build partnerships with classroom teachers, rather than trying to “fix” them as educators. This, in turn, better enables those teachers to share their knowledge and enthusiasm with their students. Inspiring the next generation of innovators is an essential component of K-12 education. Children can truly aspire to be anything they want to be if, and only if, they are willing to work for it. Educators have a responsibility to provide students with the tools to guide them through the difficult process of determining where their skills and interests will lead them in the future. Students do not understand the importance of having a strong background in math and science as they progress through their education. With the nationwide focus on testing students to determine knowledge, rather than developing critical thinking skills, we are forcing an entire generation of students to concentrate on becoming test takers and not innovators. This is where partnerships between industry and educators can truly initiate a difference via collaboration. Well over 31 million students worldwide participated in hands-on activities related to space station research from 2000 to 2006. Now, in 2010, as the International Space Station moves to assembly complete and full utilization, the opportunities for reaching the next generation grow radically. The new technological developments and scientific research taking place on station are not only cutting edge, but also applicable to our everyday lives. Many of the future careers our students will seize do not even exist today. Educators and students have a unique opportunity with the space station to participate in science while it is happening, rather than teaching about it later on as a history lesson. While speaking at the conference, former astronaut and explorer Dr. Scott Parazynski, Challenger Center for Space Science Education, stated, “NASA is in the business of taking the impossible and making it look easy.” I believe this is what educators do every day in the classroom. The space station gives teachers an amazing forum for their students. If you are an educator or student who wants to be part of some of our ongoing outreach programs, like EarthKAM, Kids in Micro-g, or the Zero Robotics Challenge, just click on the imbedded links here. Susan Mayo is a scientist and educator specialist for the International Space Station Office of the Program Scientist. Her background includes experience as a high school chemistry and physics teacher in Idaho and a scientist with a background in biochemistry, chemistry, waste management and environmental science. In today’s blog she shares her thoughts and experiences from the 2010 American Society for Gravitational and Space Biology conference with the readers of A Lab Aloft. When will we know if research on the ISS has paid off? Regardless of their past experience, they often ask me for evidence that research on the space station is worth the cost. It is a simple question, but a misleading one. This is because it counts every penny on the cost side, but fails to account for the multiple benefits in addition to research results: international cooperation, engineering accomplishments, and research accomplishments. The space station already benefits the country and the world through its construction and operation—even if it were never used as a laboratory, this would still hold true. We should not lose track of the power of daily international cooperation in constructing, operating and using the space station. The fact that this cooperation is on the cutting edge of space technology and for peaceful purposes amazes the previous generation, but is business as usual for us today. I work closely with colleagues at the main partner agencies, including Russia, the European Space Agency, Japan, and Canada; over 59 countries have participated in space station research or education activities through 2010. Space Station: Belgium (European Space Agency), Canada, Japan, Russia, and the United States. The value of the space station as an engineering accomplishment should also not be underestimated. Common standards allow parts manufactured all over the world to interchange and connect flawlessly the first time they meet in orbit. Year round operations, 24 hours a day, 7 days a week, have now extended for 11 years, and we have more than a decade ahead of us. The various life support technologies developed for station provide redundant capabilities to ensure the safety of the crew. 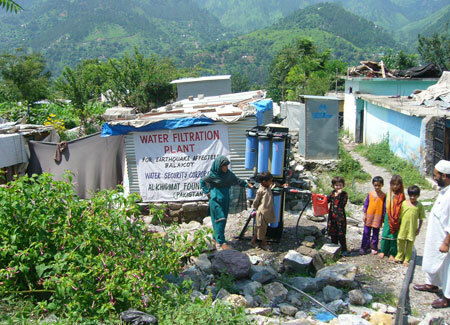 They also provide technology advances that benefit people right here on Earth—for example, new compact technologies provided water purification after earthquakes in Pakistan and Haiti. water using gravity fed from a mountain stream. Even if we could place a monetary value on peaceful international cooperation and engineering advances from building and operating spacecraft, finding the true long-term payoffs of scientific research is very challenging. Some items could be tabulated as direct benefits from space station research—things such as new materials and products that can have a measurable market impact. Beyond the obvious items, however, the calculations get fuzzy. New products can lead to long-term economic value by making safer vehicles, by extending human life, and even by advancing the quality of life. What might appear as esoteric knowledge may indeed be the first critical steps on the path to a high-value breakthrough. Let us not forget indirect benefits from educational activities, job creation, and economic growth, as well. Colin Macilwain wrote a great critical review of the general challenges of valuing the worth of science in Nature last June, Science Economics: What Science is Really Worth, which I recommend for those interested in the challenge of valuing science. In the coming weeks I will share with you stories of some of the direct benefits that I see coming from space station research. These developed from the modest research throughput during the station assembly period, prior to the full use of the finished laboratory we have today. Based on publications so far, most space station experiments take 2-5 years post-laboratory to publish results. New products related to these results take another 5-10 years or more to transition to a direct benefit. In fact, the space station will be deorbited before an accounting can be completed. Along this journey, there are some really exciting possibilities emerging. I invite you to browse developments from space station research via our key results Web site, as we monitor the progress from knowledge to direct benefits. Author Julie RobinsonPosted on November 2, 2010 June 14, 2013 Tags Benefits, Canadian Research, Education, European Research, ISS as a Laboratory, Japanese Research, Results, Russian Research, Science, Technology, US Research4 Comments on When will we know if research on the ISS has paid off? Who will be the Carl Sagan for the International Space Station? One of the first questions from the audience inspired my title for this post: Who will be the Carl Sagan for the International Space Station? It is a great question—how do we get the message about this amazing research platform out to the world? I grew up with Carl Sagan and Cosmos—everyone understood his simple message: with “billions upon billions” of stars, other life is out there and astronomy is the key to our future in the universe. He made astronomy popular and respected. His work is one of the reasons we are so moved by the deep-space images from Hubble. Carl prepared us to understand them. It is a tall order to do the same for a platform with the potential to touch dozens, even hundreds of research disciplines. As scientists, we are taught that good experiments control each variable in turn. Centuries of scientific research, however, have never controlled gravity as such a variable. How many errors in scientific theory trace back to our assumptions about gravity? What breakthrough will result from completing one of these ultimate experiments in orbit—with the effects of gravity removed? Buckle up, because we are about to find out! This is the first entry of an ongoing blog on space station research and results. We will have no single spokesperson and no single catchphrase, because the potential for discovery on the station is much larger than that. Working with my team of scientists, our research community, and our international colleagues, we will bring you the stories of the people and the discoveries as they unfold. Please join us on our journey into uncharted territory by following our blog: A Lab Aloft. Author jnimonPosted on November 2, 2010 Tags International Partners, ISS as a Laboratory, Japanese Research, Results, Science3 Comments on Who will be the Carl Sagan for the International Space Station?